Clear Plastic Shelves for Slatwall - 6" x 12"
It's easy to display a single shoe on your wall display! Using our plastic shelves for slatwall, these 6" x 12" shelves, with a 1/8" thick density, are perfect for any shoe retailer. Or perhaps you don't sell shoes. These shelves are great for smaller items, knick knacks or other product presentation needs. This versatile little shelf can be reused and rearranged to your liking, as you wish. Perfect for any retailer. Designed for use with slatwall. In stock and available for same day shipping. Great display piece! Good for shoes or even small purses. Could be a better fit. Like the shelf though. 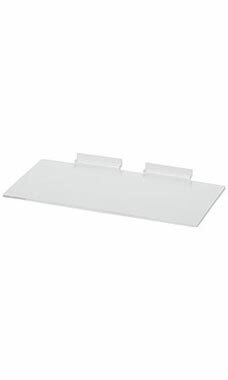 I have these on a slat wall behind the cashier and they are simple and easy to use. Fits perfect and makes a better looking presentation. Great looking but it isn't made for anything too heavy! These are perfect size for all my needs. Sleek and very modern looking. I love these versatile shelves. I have tried many different products on them and even though its not a good idea to put anything heavy on them they have held up great. I am limited on the weight it can support, but works well for many situations.